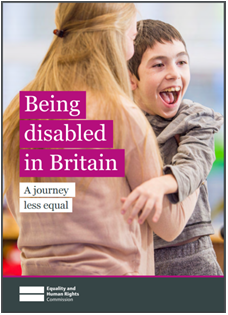 Being disabled in Britain is a review into disability inequality in Great Britain. It builds on the Equality and Human Rights Commission’s statutory five-yearly report on equality and human rights progress in England, Scotland and Wales, Is Britain Fairer? EHRC would like to see the report used by UK and devolved governments to make improvements to law and policies, by local government to ensure services meet the needs of disabled people, and by disability groups to strengthen their case for change. A British Sign Language (BSL) video of the executive summary is also available here.